Meg and Bri (BaM Choreography, and HipHopDance by STM) put together some superfun choreography that we performed at couple of spots in downtown Pittsburgh two weeks ago (Roberto Clemente Bridge, and EQT Plaza). It was pretty awesome. I'm hoping for more of these in the future. In the meantime, I'm working on a series about weather, climate, PA and the mountains. The first installment is coming soon, and I'm accepting guest articles, so contact me if you're interested in contributing. Shoulder pads are a good thing. Especially when you need them during a crash. Unfortunately, that's the one piece of equipment I left at home during the second set of races at Holiday Valley last season, when I learned one of my toughest lessons on the course (yep, that's my x-ray to the right). An experienced (medical) doctor may notice something that's not supposed to be there. 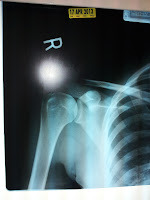 I'm used to looking at data from x-rays zapping rocks and dirt to determine elemental speciation, and so had no idea what I was looking at until the (medical) doctor explained that I was stuck with the Greater Tuberosity Blues.